Registration to any activity in ABRALIN50 must be made trough the SWGE Platform. 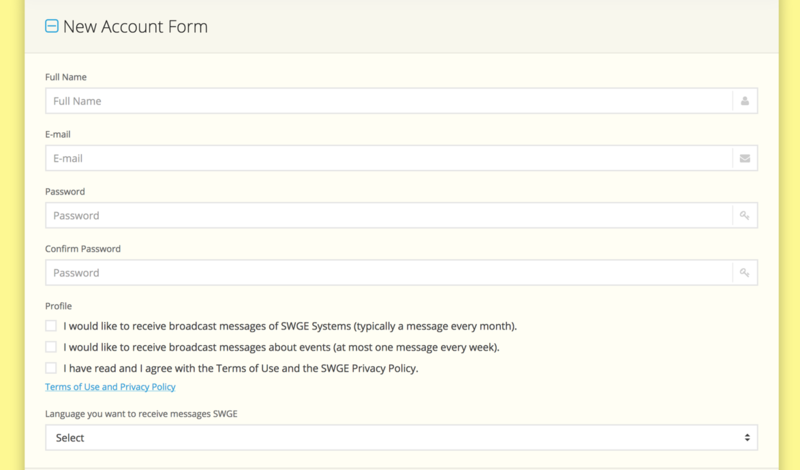 In order to access the SWGE Platform, you must have an active SWGE Account. If you already have an active SWGE account, you do not need to follow these instructions (skip to SWGE Platform Login). To create your account, access the SWG platform address for the ABRALIN50 Congress http://www.swge.inf.br/ABRALIN50/ and click on the “New Account Form” option. Then fill out the new account form and click the “CREATE ACCOUNT” button. If the information is correct, the account will be created and a message will be sent to the informed e-mail address, with instructions for ACTIVATION OF THE ACCOUNT. The SWGE Account Activation procedure must be performed only once – and ensures that the account is associated with a valid email address. To activate your account, click on the link you received in your email account. If nothing goes wrong, you will receive an email confirming the activation of the account. In case you don’t receive an email confirming the activation of the account, use the “Receive New Activation Code” option to receive a new code in your email address. If you already have an active SWGE account, you can login to this account using the “Login Form” option. Enter your registered e-mail and password and click the “E-MAIL LOGIN” button. If it is your first login, you will be asked to update your personal data. Please complete the information to update your profile so you can have access to the SWGE Platform. A logged in user screen will be displayed. If you are a foreigner, you do not have to be an ABRALIN member to participate in the event. However, you will have to pay an extra fee in order to do so (R$ 280,00 or approximately U$ 65). The extra fee will be added at the checkout. If you prefer to join ABRALIN, please use our membership system: https://goo.gl/qJuR9C. In case you have any problems or any questions regarding the enrolment, please do not hesitate in contacting us: abralin@abralin.org. In order to submit a paper to the XI International Congress of ABRALIN you must register with the “Make a New Registration” option. Please, notice: it’s not mandatory to pay the registration fee right away. You can pay the registration fee later on. Please read the section Paying the fee(s) for more information about the payment of the fess. After clicking on Make a New Registration, the registration form will open. If the information is correct, you will receive a confirmation message. If your category requires confirmation of your status, it will be validated by the organisation and you will be notified when it’s approved. If you wish to submit a paper to the event, you must first register for the event, so that the option to submit a paper becomes available. Once you have registered, go to the USER menu and select the SUBMIT A NEW PAPER option. 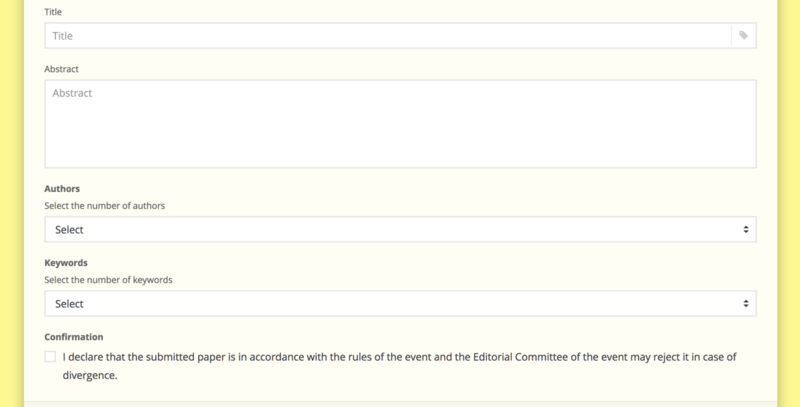 Select the Paper Language, Session, and Area to which you are submitting the paper. You should complete all the information there, paying attention to the recommendations listed in the call for papers. Once completed the form, you must send it through the SEND PAPER button. You will receive a confirmation by email. If you want to modify any information about the paper you submitted, you can do so by selecting the paper in the MY PAPERS option. To enroll in any courses and/or workshops offered at the ABRALIN Institute, you must select the “ABRALIN Institute” option. Then, the options for courses and workshops will appear. Each of these activities is organized by groups. The grouped activities occur simultaneously and only one of them can be selected. You will receive a confirmation message from your application. To make the payment, access your registration in MY REGISTRATIONS. Click on the registration number. At the bottom of the registration page, you will find a CIELO logo. To make the payment, click on the logo and fill in the requested credit or debit card information. The only form of payment is by credit or debit card. If you are a foreigner, you do not need to be an ABRALIN member. In that case, you’ll pay an extra fee called FOREIGN ADDITIONAL FEE, corresponding to R$ 280,00. This fee will be seen at checkout. There is a 10% administrative fee. Registration fees refer to the date of payment and not to the date of registration. The vacancies in the courses and workshops are only guaranteed when the appropriate registration fees are paid. After two days, in case the payment of the registration fee is not made, registration in courses and workshops will be canceled. To ensure that your paper is included in the final programme, if accepted, you must pay the registration fee in the Congress until 09/02/2019.